It is just recently that the Apple announced and released two of their latest iPhones in the market which were the iPhone 6 and the iPhone 6 plus which are considered to be their best releases so far in terms of the great technological levels they have been built in. It is because of the features such as having large screens that are relatively larger than all their previous releases, their processors are very powerful that make these two phones capable of performing various tasks with ease and at a very fast rate faster than all their previous versions. It is important that you note that Apple has come with a new look for the phones where the phones now have round corners and their bodies being also very slim making it a very easy phone to carry around and use. These two phones also come with increased effectiveness of the inbuilt applications such as its camera which is very powerful both the front camera as well as the rear camera. However its newest feature is that of the Apple phones having the online Apple payment system which makes it possible for Apple phone users to perform various transactions with their phones. Now if you are a movie lover, you will definitely love this phone since this phone has been built to make such experiences such as watching movies very interesting and enjoyable right from the large screen where you will be watching those movies from.You can use free movie downloads for android. If you like moving the movies you purchase on iTunes from your computer to your iPhone this will be a very good opportunity to do this without experiencing any difficulties. However, it is very important that you note that transferring your movies from the iTunes purchases on your computer is by far recommended when you need to transfer these movies to your phone as compared to transferring them from the iTunes movies rentals since when using the iTunes movies permanently moves the movies from the computer to your iPhone and you will therefore completely lose them if you use this method. The transfer of movies from the iTunes moviesrentals is usually this restricted since it usually uses the DRM protection policy where you and for you to transfer the movies from your computer to your iPhone, you will need to ensure that you remove this DRM protection and then you can enjoying transferring your movies to your iPhone without losing them in your computer. There are various processes you could engage yourself in removing this DRM and if you are using a Mac computer, you could very well use the readily available application for removing this protection known as the TunesKit iTunes DRM removal software which is specifically designed for the Mac people. This software will help you remove the fair play protection which is basically the policy which used by DRM to protect the iTunes movies rentals. If you are using a PC you may find it useful to use the Aimersoft DRM media converter which will be your best opportunity to removing the DRM protection and being able to transfer movies to your iPhone 6 from your computer from where you may now choose to sync all those movies to your iPhone 6 through your computer. However, there are certain situations which may arise causing you to experience difficulties in being able to sync your iTunes movies from your computer to your iPhone 6 and you may begin to wonder what the probes is. You should however not worry and follow the procedure below which will guide you on how to get your movies synced in your iPhone 6 from your computer. Since you want to use the iTunes to sync your computer movies to your iPhone 6, you will need to make sure that your computer can access the iTunes. 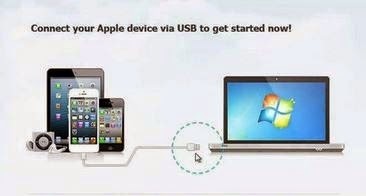 After that the first procedure to undertake will be to connect your iPhone to the computer using the available USB cable and you will notice the iTunes launching by itself and if it fails to start by itself, you should start it from your computer since you can access it after the USB connection. After the iTunes windows opens, you should proceed to clicking file option on that window which should give some more options among them new as well as many other drop down options. You should choose the add file to library option from the options that will show up after clicking on the file option in the iTunes window and after that you will be required to select which movie videos you wish to add to that library and by selecting the type of video you want and opening it, will be added to the media files of your iTunes library. After the library has been created, you should now proceed to the next step which is to access the My Computer option on your computer and open it and then choose where the movies are stored in your computer.You can download free movies to iphone.After you have selected the various movies you want to sync to your phone, you may highlight them all and then copy them to the iTunes library you just created and since the window will still be open you will not need to open it again. After that we will now move to the final stage which is very simple where you will be required to find your iPhone name according to how you have named your iPhone 6 from the iTunes and open it from where you will be required to select the videos tab options from where you will be able to see the sync movies option and by clicking on that option and selecting the movies you added to your iTunes library, you will certainly be in a position to sync as many movies as possible depending on the available memory on your iPhone 6. Surely this is a very easy process that will take very minimal time and you should try it to experience how amazing it is to watch movies with the iPhone 6. Author Bio: Prerna Puri is a tech lover. She believes that everything, if integrated with technology could be done easily. She has written some famous articles on android,iphones,movies.